In reality, truly terrible is when you lose both engines and your pilot who has one eye has to land a Boeing 737 on a narrow levee. Or when a missile tears off half of your wing just after takeoff. Nobody had any video cameras on hand for those landings, though. If subsequent CGI, or subsequent takeoffs counted, TACA 110 could be the winner. This is what we call a hard landing. It also shows you just how much the landing gear can take. Still amazes me this didn&apos;t go sideways with a bad ending. Haha. The best bit of the flight is when the captain comes on the radio and says "We are going to come very close to the monastery out the right side windows, but do not worry, this is normal." Watch out for that tree! Kai Tak Airport was closed down in 1998. Off-roading with a small plane. Welcome to Alaska. Grab a beer, it will stay cold forever. This is the best I&apos;ve seen over the years, somewhere in Alaska I think. Realizing that it won't work out in the last second is certainly better than turning into a fireball. Ignore the stupid Benny Hill music. The main lesson here is that this is one efficient way to make sure your helicopter won't roll back into the ocean on an aircraft carrier. Job well done. Any landing you can walk away from? Ignore the music. This pilot does not deserve it. This is the part when HUD and other gadgets come in handy. How about a C-17 Globemaster III landing at the wrong airport? Headed for Mac Dill AFB inbound from Italy it mistakenly touched down at Peter O. Knight airport in Tampa, just a few miles from Mac Dill (same runway heading and all.) 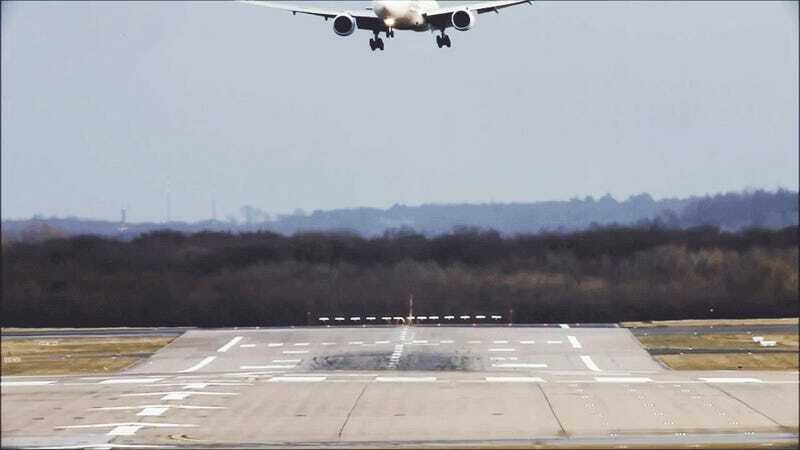 The takeoff video is as impressive as the landing video. Peter O. Knight has a runway length of 3580 ft, and the C-17 needs a minimum of 3,500 ft to land. That? Yeah, that looks like the 2 mile long runway at MacDill. A serious malfunction and some Irish luck. It's the bonus level after you've done everything. You deserve a drink.